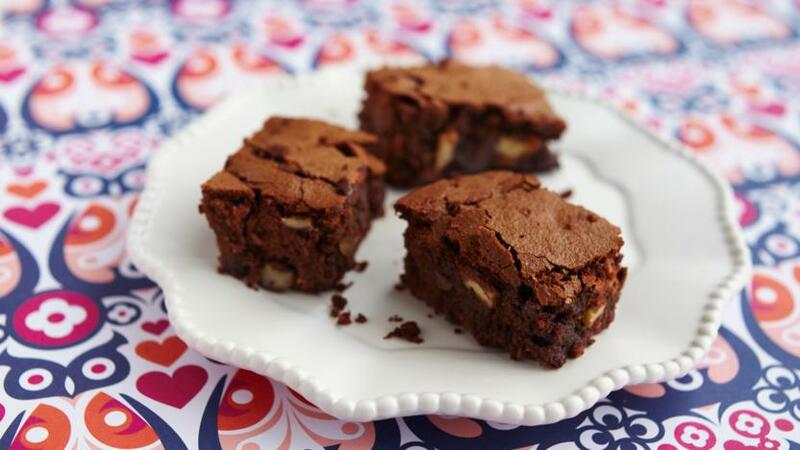 Give your brownies an exotic makeover with this sweet and simple recipe from Levi Roots. Preheat the oven to 180C/350F/Gas 4. Line a 30cm x 20cm/12in x 8in, deep-sided cake tin with greaseproof paper. Bring a little water to the boil in a pan, then reduce the heat until the water is simmering. Suspend a heatproof bowl over the water (do not allow the base of the bowl to touch the water). Add the chocolate pieces and butter to the bowl and stir until melted and glossy. Remove from the heat and set aside to cool slightly. In a separate bowl, beat together the eggs and sugar using an electric whisk until pale, fluffy and thick. Add the melted chocolate mixture and rum, if using, then whisk again until smooth and well combined. Carefully fold in the flour, using a metal spoon. Add the pecan nuts and stem ginger and fold into the mixture, then pour the brownie batter into the prepared cake tin. Transfer the brownies to the oven and bake for 20-25 minutes, or until the top is firm to the touch but a skewer inserted into the centre of the brownies comes out slightly sticky. Remove from the oven and set aside to cool slightly in the tin. When the brownies have cooled slightly, cut them into 18-20 squares or triangles and carefully remove from the tin. Pile onto a plate and dust with icing sugar, if using.